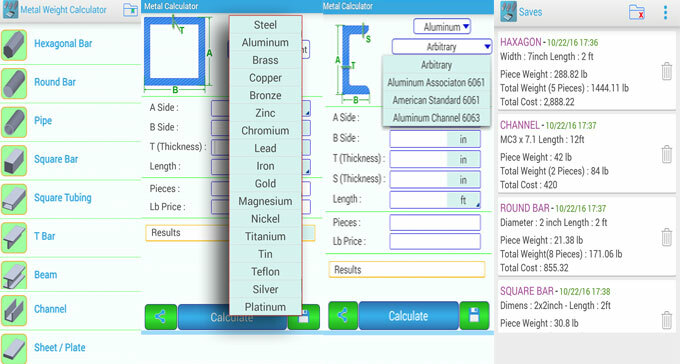 This construction video tutorial provides the demonstration of metal weight calculator. It is a powerful app available in google play store. This app is ideal for mechanical engineer, civil engineer and fabricators to find out the costing easily. One can utilize it to detect the weight of any safe metals. One can also indicate the weight of the metal to obtain the length. Pixelsdo mobile has developed this exclusive, user-friendly and mobile friendly app. It is compatible with Android 4.1 and higher version. This app is suitable for different types of metal forms or Standards ranging from Round, Sheet, Tube, Rectangle, S beam, American standard, HP - American wide flange bearing piles, C - American standard channels, HD - Wide flange columns, HP piles, MC - American channels and lots other. There are various types of sections like hexagonal bar, round bar, pipe, square bar, square tubing, T bar, beam, etc. in this calculator. Given below, some other important features of this app. - Internet connection is not necessary. Go through the following youtube video tutorial to get online demonstration.